Younger adult skiers and snowboarders want their friends by their side, a good deal in their pockets, and plenty of off-mountain entertainment. These are among the findings of a recent study of today’s ski and snowboard traveler conducted by Wyndham Vacation Rentals, the world’s largest professional manager of vacation rentals and part of the Wyndham Worldwide family of brands (NYSE: WYN). 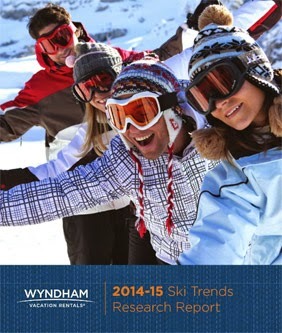 The study’s full findings are captured in the Wyndham Vacation Rentals® 2014-15 Ski Trends Research Report, which explores today’s ski and winter vacations. The findings reflect data collected from more than 3,000 skiers and snowboarders. They value promotions over tradition. 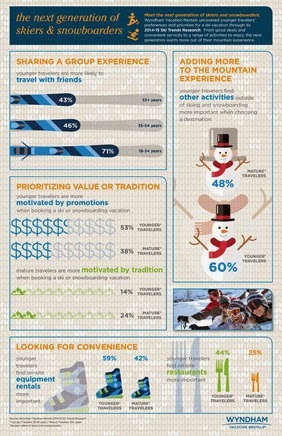 53% of younger travelers (ages 18-34) are most motivated by promotions when booking a ski or snowboard vacation compared to just 38% of mature travelers (ages 55 and up); meanwhile, mature travelers are more likely to be most motivated by tradition than younger travelers (24% to 14%). They seek a shared experience. More younger travelers find recommendations from friends and family very to extremely important when planning a ski trip, as compared to mature travelers. They are also more likely to travel with friends (71% to 43%). They want service and cuisine. Younger travelers place more value on amenities like on-site dining and concierge services. 44% of younger travelers find an on-site restaurant very to extremely important compared to 25% of mature travelers. They don’t just ski. More younger travelers (60%) find other outdoor activities outside of skiing very to extremely important when choosing a ski destination to visit compared to mature travelers (48%). They look for convenience. 59% of younger travelers find onsite equipment rentals extremely important on a ski/snowboard vacation vs. 42% of mature travelers.